Hotel Mercure, 345 The Terrace, Wellington. Join us for our annual cannabis law reform conference – with cannabis reforms in Colorado, Washington and Uruguay, as well as review of the UN drug treaties, and NZ’s ongoing debate about regulating synthetic cannabis substitutes (and why not the real thing? ), we are now closer than ever before. Don’t stand on the sidelines, join in this last big final push and together we can make it happen. Workshops, speakers and experts from NORML, Green Cross, AUT, Victoria University, Auckland University, the NZ Drug Foundation, the Star Trust, Labour, the Greens, ALCP, and more. NORML New Zealand is an Incorporated Society. The Annual General Meeting is open to all current members, and decides policy remits and any constitutional changes, accepts minutes and accounts, and elects the Board of Directors. Nominations are open for the positions of President, Secretary, Treasurer and up to six other members of the Board. To check if your membership is current, please email us. To register, complete the form below, then make your payment to confirm your registration. Registration Fee: $50.00 (includes a light lunch) OR Early bird registration fee: $35.00 if paid by 8 June. 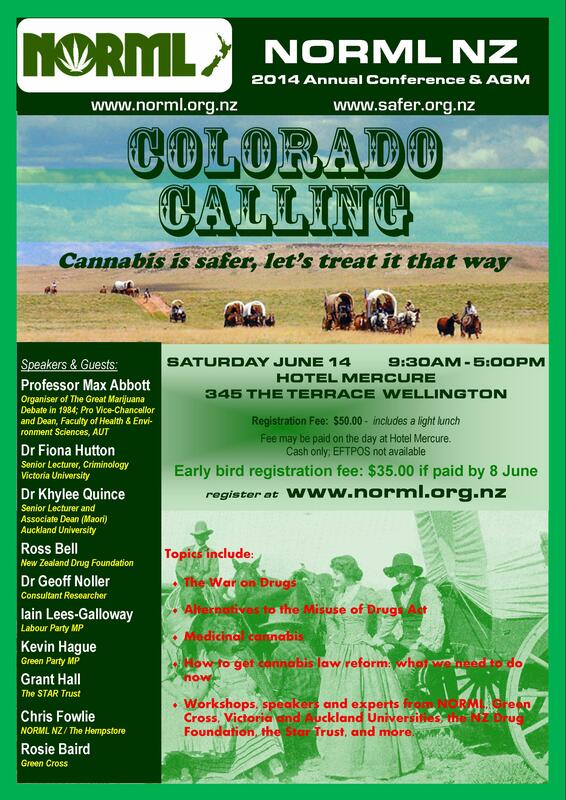 Pay online to “NORML NZ Inc”, ASB account 12-3057-0594667-00 with your surname as a reference. Or register now and pay on the day at Hotel Mercure (Cash only; EFTPOS not available). PLEASE NOTE: THE EARLY BIRD DISCOUNT IS NOW NO LONGER AVAILABLE, AND ONLY APPLIES IF PAID IN FULL BEFORE 8 JUNE. Places are limited to 100 people. If we reach capacity, priority will be given to those who have already paid. Would you also like to join NORML or renew your membership? If you choose to pay on the day, the conference may sell out before you arrive and there may not be any room for you. We strongly advise paying before you arrive, to confirm your registration. Use your surname as a reference. Let us know if you would like to be billeted (priority given to activists and members), or stay at the conference venue, Wellington’s Hotel Mercure at 345 The Terrace. There are great rooms available at a special discounted price. Call 04-385-9829 and use the booking code NORML1306. PLEASE NOTE: This is a non-smoking venue. Click here for a a live stream of the conference on Saturday 14 June, 10am – 4pm (NZT = GMT+12).